I have a method to the madness when I organize my papers, stickers, and embellishments (although it may be difficult to ascertain that method at first glance). Cardstock is sorted by color. The remaining patterned papers, I try to sort by manufacturer. Since so many of these papers are released as matching collections, it just doesn't make sense to separate them. For example, I'll keep all of my BasicGrey papers together, the Fancy Pants Designs papers together, the K&Co papers together, etc. Finally, any remaining patterned papers are sorted and stored by color. Pink floral, plaid, striped and dotted paper together, Purple floral, plaid, striped and dotted paper together, (then blue, then green--you get the idea). I usually have one section for multicolored patterned paper, too. These are sorted by theme, then color if they don't fit into a particular theme. I store all rub-ons by color, no matter what the theme. Occasionally, I like to keep an entire line of papers, embellishments, stickers, and rub-ons together. Usually my reason for doing so is because I create samples for that particular manufacturer (Pink Paislee, for example). When I work for a specific company, I am usually asked to create samples using only their product. In that case, it is best to store everything together for easy access to matching collections. I like to use clear paper sorter bins for this type of storage. That's the Bayberry Cottage line above, but I have a clear storage container for each particular collection from Pink Paislee. I label the outside so I can see at a glance what is contained within each plastic bin. Very handy and it's the best method I've found so far!! Let me know if you've found a better way or something that works better for your particular needs, but this method has been working really well for me lately! Here are a few miscellaneous storage photos from my old scrapbook room. I use glass containers from The Container Store to hold many of my embellishments. I group them by like items: bookplates, flowers, buttons, etc. I had these stacked on a shoe rack on top of the desk. The containers below are from the Pottery Barn. I used them to store smaller stickers and rub-ons. I stored them by theme within the containers. Next to my desk, I used Making Memories MOD storage on the wall. This is where I kept frequently used items such as brads and colored chipboard. I like that it was magnetized and I could pull off the section I needed to place on my desk, then easily replace it when I was finished. OK, this is the part everyone loves about the scrapbook room: the paper rack. It does fit a LOT of paper. I'm a paper fanatic, though, so paper storage has always been important to me. The builder I used constructed the main portion from 3/4" plywood and the shelves were made from 1/4" plywood. Plywood is not the safest choice for storing paper, but I thought it was economical. 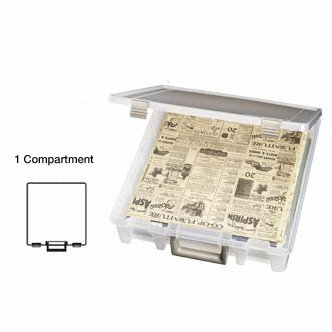 IN RETROSPECT (because all of these posts are made in hindsight), I would have purchased quite a few portable paper storage containers from The Container Store. The storage above wasn't very cost-effective when all was said and done. So that leads to an important question for my Type A personality: what is the best way to store paper? I love having it organized and easily accessible. I have always stored my cardstock together, grouped by color. I also store holiday themed papers together. I have the following categories: Christmas, Valentines, Halloween, and Easter. I also have categories for a few other themes I like to keep separate: School, Baby Boy, and Baby Girl. Other than that, I store papers according to my favorite manufacturers, or by color if I don't know who made it. I do admit that I have quite a paper collection. After all, it's my job to scrapbook and it has been for the past 11 or 12 years. That's quite a bit of time to collect paper. I'm still collecting it, but I try to only purchase something if I have a specific use in mind for it. Anyone have any great tips for storing paper? She's just like her mommy: she likes to work standing up. Her desktop was a glossy white painted plywood surface (like mine, discussed here). The coolest thing about her work space was the hinged cubbyhole in the surface of the desk. She could work on a project, then slide it into the storage area to keep her work surface clean (not that she ever DID that, of course). If you look on the photo above, the hinged storage is in the desk, just to the left of where she is standing -- not to be confused with the storage cabinet directly above it. I kept a bulletin board to the left of her desk so she could rotate her artwork and keep it on display. Just above her head there was a rolling paper dispenser with a never-ending supply of white paper. She could tear pieces off and use as much as she wanted (so she wouldn't use up all of my scrapbook paper!). All of her tools and supplies were stored in baskets. I love using baskets for kids, because it means easy cleanup. She could just toss her scissors into one basket, crayons and pens in another, and glue in yet another. "Toss and Tuck", I'd say (as in, "tuck away"). It's difficult to see in the photo, but the white cubes on the right side of the photo are paper storage cubes (you can only see the sides of them). I stored cardstock and patterned papers in them. I tried to put items I didn't mind sharing in those cubes, because any item within Daisy's immediate sight tended to be put towards a creative use. What can I say...she is an imaginative little girl. The desktop is built-in over air conditioning ductwork. The ductwork was low, and I didn't want to close off the entire wall, so I added the desk above it with a small kickspace below. I tried to utilize as much space as possible. The dark space behind the desk is an opening in the wall that looks over the living room (it was dark when I took the photo). When I had the room built, my daughter was about 4 years old so I wanted to be able to keep an eye on her while I was working. It was also convenient for TV watching, since the TV was in the living room. It's painted a glossy white, because I thought that would be easy to clean up. In retrospect, it wasn't so great, because inks and markers stained it. I could lightly sand the stains out, but then the areas were dull compared to the rest of the table. If I could have done it all over again, I would have used Corian or some other easy-to-clean surface. The drawer pulls were from a cute little boutique in town that has since gone out of business. The drawer to the left was filled with embellishments. The middle drawer had tools and adhesive. The drawer on the right was filled with inks. I did it that way on purpose, because I'm right-handed and I worked at the space on the left. The drawer with the tools was in easy reach and could also be utilized by anyone scrapbooking with me at the space on the right. The area painted green is another window overlooking what was my daughter's bedroom, so she could be in there and I could keep an eye on her. The desk space shown above was designed for Daisy, because I wanted her to have her own little area to be creative. That desk is also built over air conditioning ductwork. The ceiling there was very sloped, so it wasn't a very usable space -- but it worked just fine for a child. I'll be back with more photos and details about the space in the next post. By the way, what other company can take a rubber band ball and turn it into a fabulous accessory? I love every detail in the photo above. Pottery Barn stylists are very good at details, and I'm very into details, so we are a good mix. Me + Pottery Barn = Match Made In Heaven.